LUDVIG XVI, King of France. Passport, printed and handwritten, signed “Louis”, for m. Felix Soffiet “fabriquant de bas”, for a journey from Paris to Gothenburg. Dated Versailles March 3 1782, 1 page in folio, some tears in the foldings. Countersigned De Vergennes. Charles Gravier, Count of Vergennes (29 December 1719 – 13 February 1787) was a French statesman and diplomat. He served as Foreign Minister from 1774 during the reign of Louis XVI, notably during the American War of Independence. Vergennes hoped that by giving French aid to the American rebels, he would be able to weaken Britain’s dominance of the international stage in the wake of their victory in the Seven Years’ War. This produced mixed results as in spite of securing American independence France was able to extract little material gain from the war, while the costs of fighting damaged French national finances in the run up to the Revolution. He went on to be a dominant figure in French politics during the 1780s. 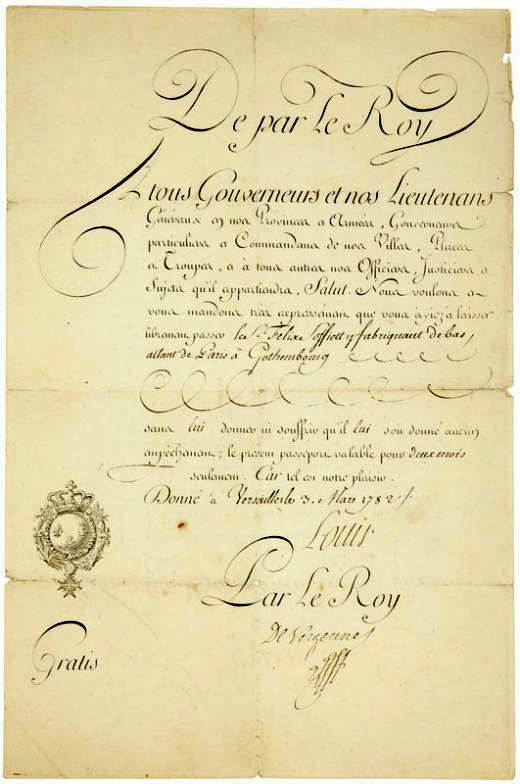 Hello, I have a passport in my collection, dated September 21, 1778, in Versailles. The second signature is allegedly Charles Gravier, the Duke of VERGENNES. But I think it’s another signature, another man. Pas was issued for Sr. Dumas, SAXON for return home – to Holland. Indeed George but I know from a historian that the signature isn’t necessarily made by the king himself but could also be made my one of his close officials. Hard to tell. Thanks, Tom.